Yesterday was a big day for fans of the Harry Potter franchise, with Warner Bros. revealing that Fantastic Beasts and Where to Find Them 2 will now be entitled Fantastic Beasts: The Crimes of Grindelwald. The studio also revealed a new cast photo featuring our first look at Young Dumbledore. With production still under way on this magical sequel, producer David Heyman recently shed some light on the casting in a new interview. Jude Law was cast as Dumbledore back in April, but the full cast photo released yesterday offered our first glimpse at the future Hogwarts headmaster. Jude Law was quite the surprising pick for many fans, although many warmed to his casting after the first photo debuted, even though he may not have been the most conventional choice to play the iconic wizard. 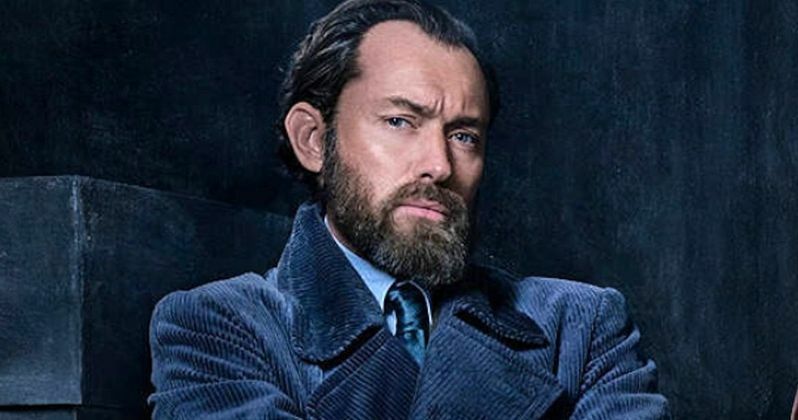 Producer David Heyman revealed in a new interview that Jude Law was cast because he possesses many of the same qualities that they have found in the Dumbledore character. "One of the reasons we chose Jude is he has many of the qualities we find in Dumbeldore in the Potter films. He's got authority, he's got a twinkle in his eye, he's sometimes a bit elliptical. So you have that but also have this youthful energy and jubilance. So he brings that twinkle, mischief, authority, and power, but at the same time brings far more youthful energy to the film. You understand why he would be your favorite teacher and be someone you believe is an extraordinary wizard." It was confirmed in November, just before the release of Fantastic Beasts and Where to Find Them, that Dumbledore would in fact appear in Fantastic Beasts 2, leading to endless bouts of speculation as to who would play the iconic wizard. Richard Harris originated the role in Harry Potter and the Sorcerer's Stone and Harry Potter and the Chamber of Secrets before the iconic actor passed away in 2002. Michael Gambon took over the role for the remainder of the franchise, but when there was talk of who should play the young Dumbledore, Richard Harris' son Jared Harris revealed he would love to play the role. While some thought it was the actor's "birthright" to play this role, the studio went in another direction with Jude Law. Fantastic Beasts 2 production started this summer in the U.K. and France, with the story moving from London to Paris in this sequel. Jude Law was featured in yesterday's photo alongside Ezra Miller as Credence, Claudia Kim appears as a Maledictus, Zoe Kravitz as Leta Lestrange, Callum Turner as Newt's older brother, Theseus Scamander, Katherine Waterson as Tina Goldstein, Eddie Redmayne as Magizoologist Newt Scamander, Dan Fogler as Jacob Kowalski, Alison Sudol as Queen Goldstein and Johnny Depp as Dark wizard Gellert Grindlewald. Warner Bros. has set a November 16, 2018 release date for Fantastic Beasts 2, which will go up against 20th Century Fox's Widows, starring Viola Davis. Entertainment Weekly broke this news on Fantastic Beasts 2 earlier today.